Roz and Lil (Robin Wright and Naomi Watts) have been friends as long as they can remember and have shared just about everything life has to offer. Their sons Ian and Tom (Xavier Samuel and Ben Mendelsohn) have also grown up together as the best of friends and are seemingly ready to conquer the world. As the two women deal with emotional struggles that have them questioning where they stand in life and relationships, they end up giving in to desires they have secretly shared by allowing each other's sons to seduce them. Knowing that what they are doing may not be the best thing for any of them, the mothers, sons, friends, and now lovers, at first attempt to enjoy their new found passions, but both Roz and Lil soon begin to realize that they may not be able to maintain their respective relationships. If all of that seems a bit confusing and convoluted, you really aren't that far off from how I felt before watching the movie, but trust me when I say that Adore is an emotionally strong bit of filmmaking that doesn't pull any punches when it comes to the topic at hand. 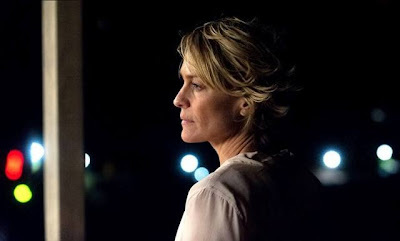 One of the first things that drew me in was how director Anne Fontaine managed to get such strikingly honest performances from the co-leading ladies. Wright and Watts each have a command of the characters and a presence that gives immediate credibility to the story and each of them is given the opportunity to show off how gifted they really are. In all honesty, this isn't the type of movie I would normally rave about, but the performances are stunning to watch and Fontaine does a great job of keeping the audience fully engaged in the story. 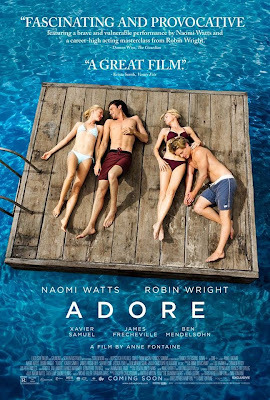 Adore is a movie you will not be able to take your eyes off of and you will have a hard time letting the characters go once the credits begin to roll.